Shoes, glorious shoes. Shoes are far more than functional. At least for many of us, shoes are a form of self-expression, of beauty, of aspiration. We want to be the woman who’s wearing these shoes! Shoes are one of those intriguing style elements around which there are many thoughts and feelings. Some women love them, others are indifferent to them. Each find the other amazing. We know that shoe styles communicate. They tell us what era they are from. They tell us something about the woman who wears or wore them. They tell us something about the times, the trials and tribulations, and the triumphs. Shoes are SAYING something. Even if we wish they weren’t, they are. Some of us have a thing for shoes. Shoes talk to us, luring us in. As a result, we covet shoes, we long for them, we hanker and pine, obsess and ponder. We see a shoe of a particular shape, colour, heel height, design, fabrication – and we lust after it. We don’t know why this happens. We just do. But interestingly, too, that some women do not have a thing for shoes. It seems that shoes don’t talk to these women, at least not in the same way, volume or tone that they talk to women who have a thing for shoes. I know one woman who has a mere two pair of shoes – one for winter and one for summer. This is the most extreme case I’ve ever heard of, although I know a woman who has only 10 pair of shoes. This seems like a very scant shoe wardrobe to me but it works for her, she’s happy with those 10 pairs and only those 10 pairs. How shoes fit into our style expression is deeply personal. Shoes can be the starting point for your outfit creation. You don’t have to start to compile today’s ensemble based on the jacket or pants or other staple of the ensemble. You can start with the shoes, and work up (literally!) from there. Shoes can be the focal point of your outfit, too, if you choose. And worth noting is the fact that our taste in shoes changes, as do our needs and requirements of our shoes. What I loved to wear, or had to wear, in my 20s in shoewear has changed significantly to what I want to, and feel I can, wear now. I don’t have a single pair of classic black pumps in my shoe wardrobe now, whereas they were a staple in my 20s when I was enmeshed in the corporate work scene. Physical needs and what styles of shoe are comfortable or excruciating to wear, where there is a pain threshold which some shoes overcome and others fall short of or even if uncomfortable shoes are worn at all. Personal circumstances including lifestyle and work situation and what shoes are required for your life and your work. Personal factors such as coloring and preferences around scale, texture and pattern. We each prefer different things here in our style items, including our shoes. Dressing Style preferences and whether a woman prefers a Classic style in her shoes, or if she turns to Creative, Rebellious, Feminine, Relaxed, Dramatic or Elegant Chic in her shoe collection. Each of these 7 Dressing Styles has a distinct set of shoe criteria, and depending on which Dressing Styles are showing up in your style expression, your shoe choices will change. Below you will see some different examples of shoes for each of these seven Dressing Styles. Check them out and reflect on which shoes you’d choose and why, including how the shoes you chose (or desire) express part of your personality. How does your personality influence your shoe choices? What personality dressing style do you like to wear on your feet? You may find this podcast and blog post a useful resource to expand your knowledge on the subject of the interplay between personality and dressing styles. This article on authentic style expression (and specifically the Classic dressing style) is also good reading on the dressing styles. We also have these additional pieces linking the dressing styles to the 16 Style Types: The Little Black Dress, and Leopard Print. This is intriguing reading, showing a new and innovative link between style and psychology. Whilst we can’t definitively describe let alone proscribe what a woman of a particular Style Type might desire or need from her shoes, what we can do is point to is the motivation that each of the 16 Style Types might have when it comes to their shoe needs, desires, requirements, and preferences. Let’s see what we might discover when we start at the Super Style level. Sensing-Feeling (SF) might be looking for beauty and practicality in their shoes. We might consider the SFs the Shoe Beauticians. More about the SF Super Style here. Sensing-Thinking (ST) could be going for function and efficiency in their shoes. Perhaps the STs could be thought of as the Shoe Pragmatists. Read more about STs and their approach to style here. iNtuition-Thinking (NT) are possibly seeking durability and accomplishment from their shoes. Perhaps the NTs could be considered the Shoe Architects. Explore more about the NT approach to style here. iNtuition-Feeling (NF) may be pining for value and comfort in their shoes. Let’s refer to the NFs as the Shoe Crusaders. Read more here about the NF Super Style. What kind of boots would you choose? Shoes need to look good, be aesthetically pleasing, and flattering. They need to harmonize with the entire ensemble, which has been thoughtfully pulled together with all the little details considered. Shoes encourage conversation, whether a quick chat on the street with a stranger, or an in-depth chat about why these shoes, and why this outfit, and oh, how fabulous they are! Shoes need to blend with the entire wardrobe and of course with each individual outfit. Shoes need to be versatile and practical, shoes here are down to earth. Shoes need to support the outfit chosen for the day, they’re understated and even if they bring a wry smile to the wearer, they rarely stand out. Shoes can be a statement in and of themselves. It’s fun to have shoes nobody else does, and shoes that are fun and even funny. Shoes that stand out or draw attention to themselves work here, they might be a bit different but they might just be a bit unexpected. It’s okay if shoes make you laugh, but they should never make you cry. Shoes here need to balance the need for whimsy with practical comfort. Heels, flats, boots – whatever they are, they go beyond the basic and say something about the wearer. There’s always something a little different about shoes here, even if it’s just one thing. Shoes should never be dull, bland, or overly basic. Balance is important, literally and figuratively, here. Shoes need to balance the entire ensemble visually. Shoes need to balance the budget and make economic sense and be a great cost per wear. Shoes need to balance professionalism with function. Shoes need to perform. Shoes must be appropriate here, and for many occasions. Subtly stylish, the shoe must pay its way in making the entire ensemble work. Shoes help put the wearer’s best style foot forward. Shoes here shouldn’t draw too much attention to themselves and of themselves. Shoes support, ground – never shout or dazzle. Shoes here should be interesting in some way, perhaps in a small detail or making a larger statement. They should be 100% pragmatic – shoes need to work and empower the wearer in all the activities she’s engaged in today. Shoes are best if adaptable and changeable up or down the style scale. Shoes should be pragmatically funky and interesting. Shoes here need to fit within the self-defined style structure. Uncomfortable shoes will never be worn. A bit different is okay (nifty or novel in some way often appeals) but pragmatically comfortable is essential. Shoes need to last a long time and not be too tied to fashion trends. Shoes here may be bold, they may “point the way”. Shoes can be the focus of the entire ensemble, “watch me walking”. Whether it’s in construction, shape, the material/fabric the shoe is made from, an important detail which defines the shoe – shoes here have a presence. Shoes help keep the wearer’s feet on the ground, balancing concrete functionality with creative vision. Whether it’s color, print, texture, embellishment, construction/shape – there is always something unique about the shoes that really suit the wearer here. Shoes are probably never going to be the style statement here – shoes serve a clear purpose and shouldn’t claim attention that rightfully should be elsewhere (those big ideas). Here, shoes work best if current fashion data informs the wearer of up-to-dateness – it’s simply too easy to forget all about shoes and slip out-of-date. Shoes here offer an opportunity to demonstrate individuality in a less visible, lower consequence, style item. Shoes may not warrant much thought or attention here but when they do, they work best if they make logical sense and fit individual criteria within the wearer’s subjective style system. Shoes here take the wearer to all the places (and people) they’re going. Shoes support congruent style expression and allow other style items to be the stars of the show, especially items close to the communication centre (the face). There’s always a functional element to shoes, even if that function is pure beauty. Shoes here subscribe to the personal, self-defined style rules the wearer has identified. Truly successful shoes here rarely, if ever, deviate from the style aesthetic and parameters the wearer knows are crucial to her sense of self and her life needs. Shoes are part of an ensemble, rarely the focus: they subtly support. Shoes here may be one of many varieties, from a possibilities playground where a large shoe wardrobe is created (take care that there’s a sturdy throughline that connects shoes to other parts of the wardrobe) or shoes may be the last part of an outfit to be considered and conscious effort may be required to go beyond basic requirements. Shoes are personally meaningful here. How they show up may vary enormously from one INFP to the next – style expression reflecting the great variety of style values INFPs can hold. Shoes may be a whole category of their own, or a rarely considered necessity. Shoes must meet internal subjective values. Each of the 16 Style Types represents patterns in how style information is accessed and assessed. 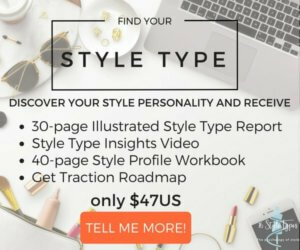 The 16 Style Types describe the style essence of the 16 personalities, but they cannot define and prescribe the style expression of the Style Types. Wherever shoes fit into your style expression, we hope that this brief journey into the land of shoes has shed some light into how you might think and feel about shoes, and where shoes fit into your style motivation, depending on your Style Type. Which flats would you wear? Style is a deeply personal journey, and we take our mission here at 16 Style Types seriously: to hold the light as you find your own way home to your style essence. How shoes fit into your style expression is entirely up to you!